Wednesday May 10 1911 I ironed and did baking in forenoon and sewed carpet in the afternoon after I helped Will make some garden We had some work done on fences. I went down home to spend the evening. Thursday may 11 1911 I sewed on the carpet all day, finished it in time to get supper and went down home a couple of hours. Will planted the corn today. I had word from Mary her Father, Mr Green had died. Friday May 12 1911 Friday May 12 1911 Will helped me put down the carpet in my room and he took up the one in his room so I cleaned the floor before dinner. We got that down and both seems in order to sleep in. We have been married 25 years today. 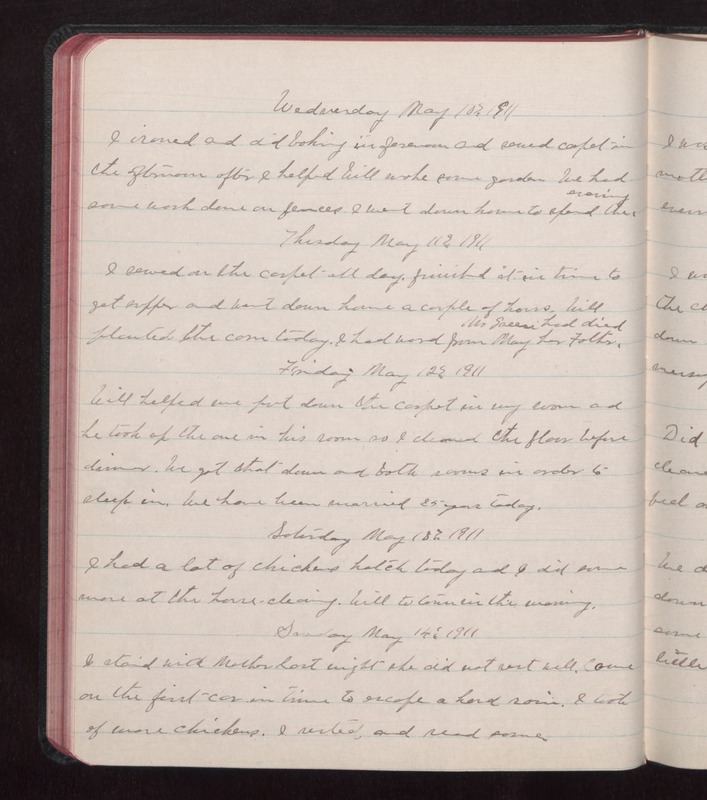 Saturday May 13 1911 I had a lot of chickens hatch today and I did some more at the house cleaning. Will to town in the morning. Sunday May 14 1911 I staid with Mother last night she did not rest well. Came on the first car in time to escape a hard rain. I [took?] of more chickens. I rested and read some.